Cardiovascular issues such as heart disease, high blood pressure, clogged arteries, and a weakened aorta. Lung, esophageal, stomach, and pancreatic cancers. Reproductive issues for men and women. Increased frailty in older men and women as well as premature aging. An overall decrease in quality of health. To put social smoking into perspective, consider this: Jack E. Henningfield, PhD, a professor of psychiatry at Johns Hopkins Medical School, explains that a social smoker that smokes just four times a week is putting his or her health at risk, as it’s the equivalent of inhaling exhaust fumes from his or her car. People wouldn’t go out and inhale car exhaust, but rarely think twice about having a cigarette every now and then. Although social smokers feel as if they are in control of their cigarette use, it doesn’t mean that they aren’t immune from becoming dependent on cigarettes and becoming a regular smoker. While some smokers can go days or weeks without smoking, their craving for nicotine may continue to build up until they can’t resist the urge to have a cigarette and overtime, the frequency of “breaks” between smoking may decrease. The best way to keep from becoming addicted is to quit cigarette use all together and try to figure out why you choose to smoke or what triggers your use. Talk to your doctor. 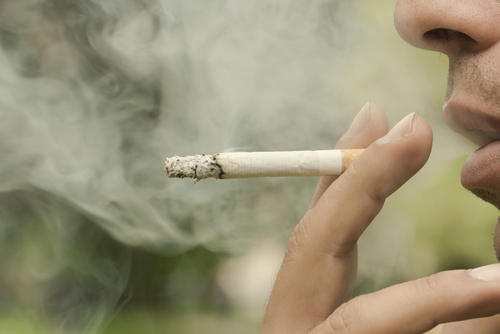 Although a regular cessation program may not apply to your cigarette use, discuss your options with your doctor. Change up your routine. Do you only like to smoke during Wednesday night Happy Hour? Until you can go out with friends and comfortably avoid smoking, choose another activity with friends. Ask for support. Many social smokers are also private smokers, which means that friends and family may not know about cigarette use. However, if you ask your friends and family to help you out (and hold you accountable), you may be more successful in quitting your social smoking lifestyle. Be the first to comment on "Social Smoking Dangers"